For those of you with the detective skills of the Martian Manhunter, you've probably already noticed a small tweak here at IADW, and that's it's address. 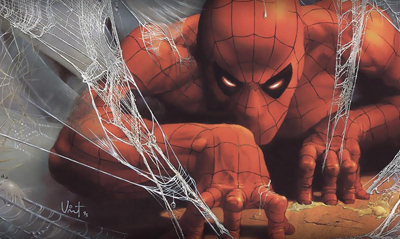 Putting the web Spidey uses to catch criminals in to shame, It's A Dan's World will now continue to round up the best in illustration and comic happenings daily, all in one giant .net. The transition process takes about three days to complete, so please bare with me if you notice the odd bug during that time. Lately, I've really refined my ideas on what I want this blog you and I share to cover, and as part of that 'think' I realised this shift was long overdue. If you're in the team-up kind of mood, you can help out by ensuring any bookmarks you might have link through to www.itsadansworld.net otherwise just sit back and enjoy all that lies ahead!